According to the adage, March "comes in like a lion," and that is exactly what it did this year. March 1 was a windy day, but nothing like the tempest that hit us this morning March 10, 2016. A pair of low pressure systems (dubbed the "Evil Twins") came ashore over British Columbia Thursday night. The National Weather Service predicted the worst of it would begin about midnight and peak around 06:00 a.m. PST. 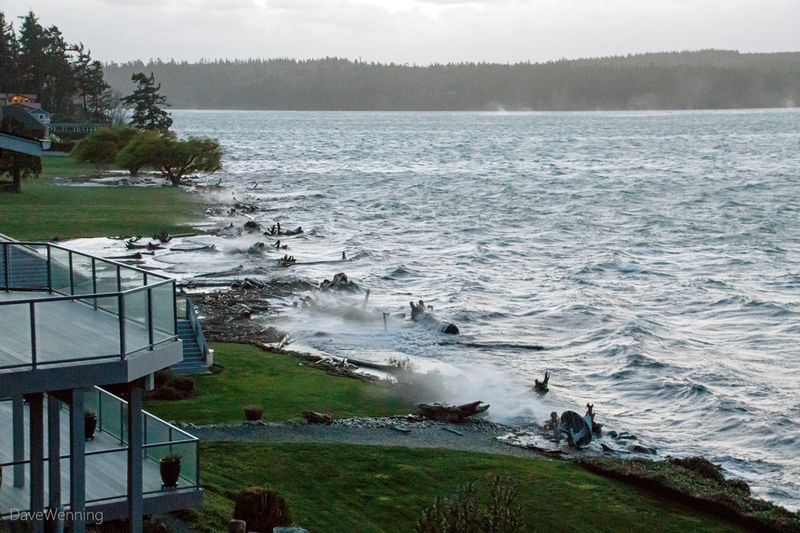 For some reason, Pacific storms like to cross over Vancouver Island when they come ashore. When this happens, the Puget Sound Basin becomes a wind tunnel. The Olympic Mountains to the west and the Cascades to the east have a funneling effect. 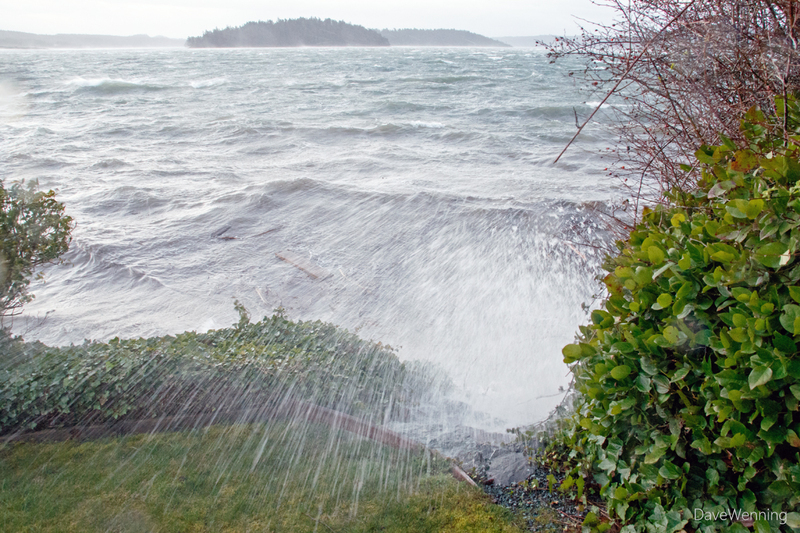 This can deliver strong southeasterly and southerly winds up Saratoga Passage and Skagit Bay to Fidalgo Island. It was still fairly quiet when I went to bed, but the noises of the wind woke me at 4 a.m. By 06:00, there was enough twilight for me to see what was happening on the beach. 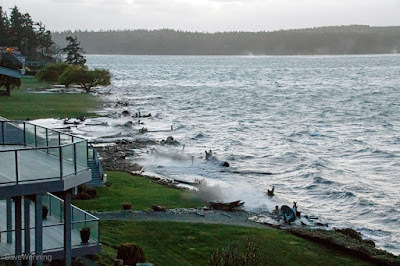 The predicted high tide here was ll.4 feet at 06:04 a.m. At almost that exact moment, my weather station measured a windspeed of 42 miles per hour, 68 k.p.h. 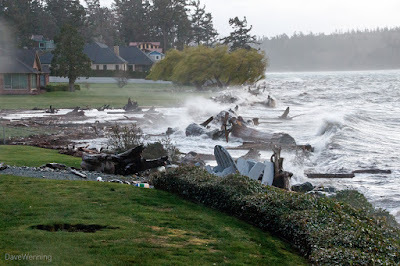 Because of the storm's low pressure and storm surge, the NWS issued a warning that the tides would be an additional 1.9 feet higher than predicted. That would make it 13.3 feet here. 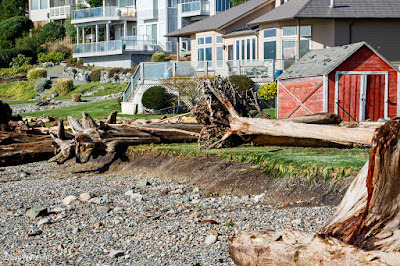 That becomes a problem when the land is only a little over 11 feet. 07:52: There was now enough light for the picture above taken from my front deck. My neighbors' front lawns were being overwashed by sea water and driftwood. Click or right-click the photos to view them full size. 07:55: I took the camera down to the shoreline and caught this photo at the top of my stairs to the beach. The islands on the horizon are Skagit and Hope. 08:01: It was a bit scary to get down near the water like this. The winds were still strong enough to make it difficult to stand and take photos. Nature had become wild and noisy. Some seawater splashed onto the UV filter causing the hazy spot in the upper left corner. 08:11: One last shot of the storm from my front deck. 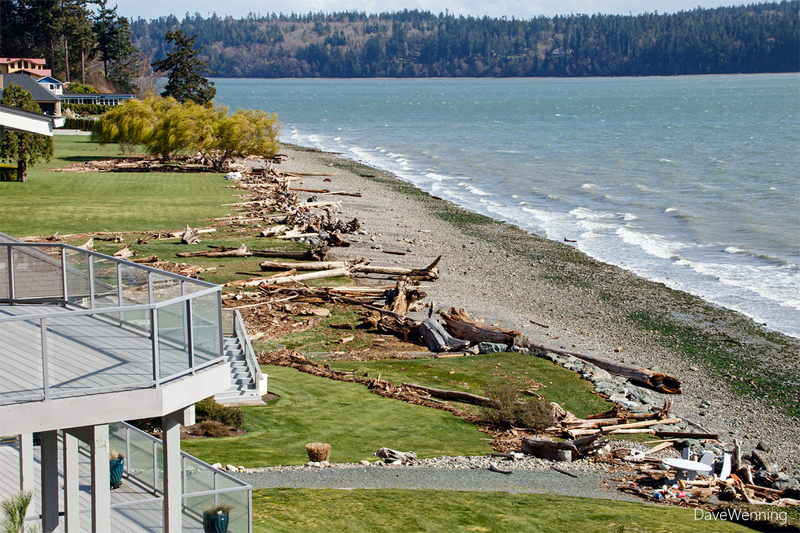 The actual shoreline is revealed by the driftwood. Are we getting a preview of what rising sea levels could be like? 12:01: By afternoon, the wind was dying down a bit and the sun came out. By 15:00 the winds were 10-15 m.p.h., 16-24 k.p.h. By 16:30, the winds were calm. 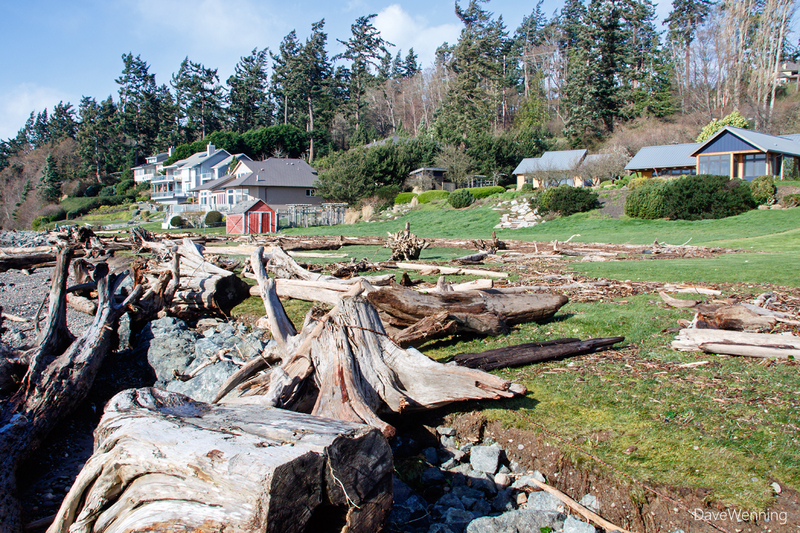 Some of the neighbors' shoreline was washed away and giant driftwood logs were tossed onto their lawns. Left: My neighbor's chain link fence is ruined. 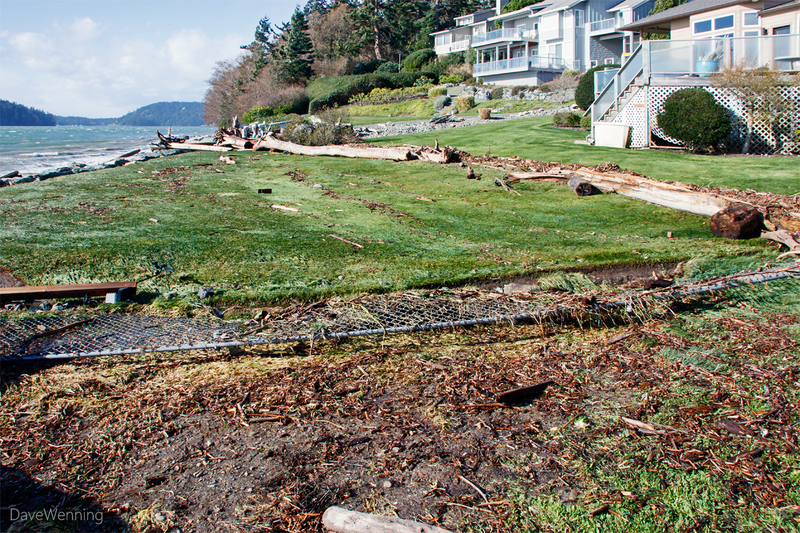 The line of debris and driftwood shows how much of the lawn was overwashed. 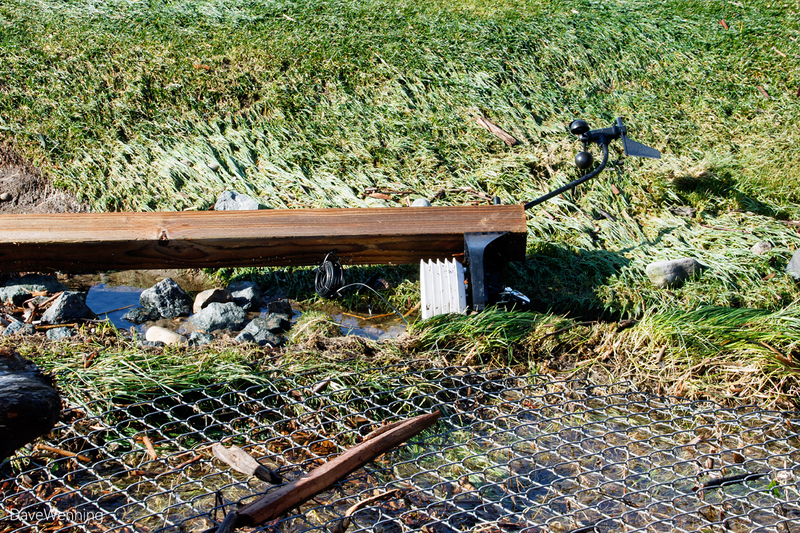 The sea crossed it like a river and took out the fence. There is really very little we can do to control wind and water. Right: Their Vantage Pro2 weather station was also destroyed. Poor baby, this is painful for me. 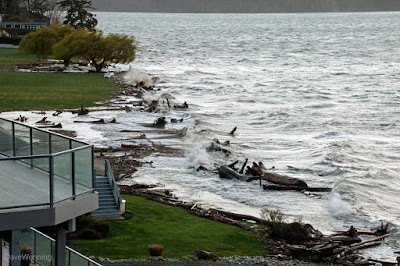 Its mounting post was uprooted and tossed inland. The rain bucket, solar panel and circuit board housing were nowhere to be seen. Amazingly, the anemometer was spinning and the wind vein was pointing when I took the photo. The station was hit before by a storm in 2010, but not to this extent. The windstorm of March 10, 2016 will be remembered by this South Fidalgo Island neighborhood.